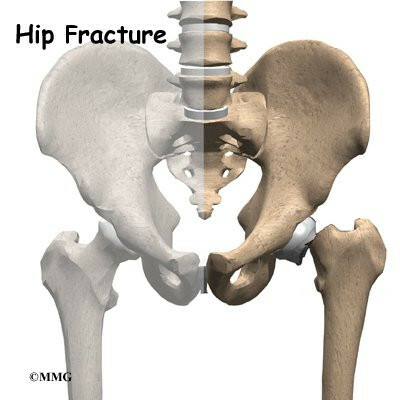 As the population ages, the number of hip fractures that occur each year rises. 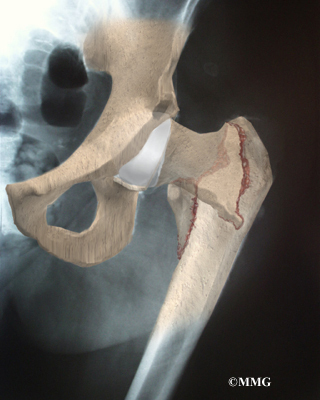 A fracture of the hip in an aging adult is not simply a broken bone. It is a life-threatening illness. The hip fracture itself is rarely a difficult problem to solve. But once the fracture occurs, it brings with it all the potential medical complications that can arise when aging patients are confined to bed. The complications are what can turn a simple break into a life-threatening illness. Hip fractures in children and young adults are much different. The information in this document applies only to hip fractures in the elderly. The hip joint is one of the true ball-and-socket joints of the body. The hip socket is called the acetabulum and forms a deep cup that surrounds the ball of the upper thighbone, or femoral head. The femoral head is attached to the rest of the femur by a short section of bone called the femoral neck. The bump on the outside of the femur just below the femoral neck is called the greater trochanter. This is where the large muscles of the buttock attach to the femur. Thick muscles of the buttock at the back and the thick muscles of the thigh in the front surround the hip. 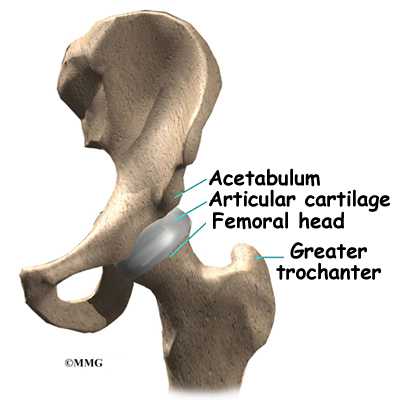 The surface of the femoral head and the inside of the acetabulum are covered with articular cartilage. This material is about one-quarter of an inch thick in most large joints. Articular cartilage is a tough, slick material that allows the surfaces to slide against one another without damage. All of the blood supply to the femoral head (the ball portion of the hip) comes through the neck of the femur. If this blood supply is damaged, there is no backup. One of the problems with hip fractures is that damage can occur to these blood vessels when the hip breaks. This can lead to the bone of the femoral head actually dying. Once this occurs, the bone is no longer able to maintain itself. This can lead to one of the complications of a hip fracture called avascular necrosis (AVN). Injury is an obvious cause of hip fractures. In the elderly population, an injury can result from something as simple losing one's balance and falling to the ground. While many hip fractures probably occur this way, it is also true that the fall may have happened as a result of fracturing the hip. The hip actually breaks first, causing the person to fall. Osteoporosis can weaken the neck of the femur to the point that any increased stress may cause the neck of the femur to break suddenly. An uncertain step may result in a twist to the hip joint that places too much stress across the neck of the femur. The femoral neck breaks, and the patient falls to the ground. It happens so quickly that it is unclear to the patient whether the fall or the break occurred first. What does a hip fracture feel like? A hip fracture, like any broken bone, causes pain. The fracture makes putting weight on the leg extremely difficult. When a hip fracture occurs in an aging adult who lives alone, it may be hours before anyone finds the patient. The patient sometimes cannot get to the phone to alert anyone. This is the first life-threatening situation. This situation can result in dehydration, or if the fracture occurs outside in a cold environment, the patient may develop hypothermia. Both of these conditions can be deadly. The diagnosis of a hip fracture usually occurs in the emergency room. The diagnosis begins with a history and physical examination. It is important that the doctor be advised of any other medical problems the patient has so that treatment of the hip fracture can be planned. Most of the information from the history and physical examination will be used to try to evaluate the overall physical condition of the patient. Tests such as chest X-rays, blood work, and electrocardiograms may be ordered to assess the patient's overall condition. X-rays are typically used to determine if a hip fracture has occurred and, if so, what type of fracture it is. The orthopedic surgeon will use the X-rays to determine if a surgical procedure will be necessary and to decide what type of procedure to suggest. In a few cases, X-rays may not show the fracture. If the hip continues to hurt and the doctor is suspicious that a hip fracture is present, magnetic resonance imaging (MRI) may be suggested. The MRI scanner uses magnetic waves rather than radiation to take multiple pictures of the hip bones. The MRI machine is very sensitive and can show fractures that do not show up on regular X-rays. This test is done to be certain there is no fracture before allowing the patient to put weight on the leg. Walking on a fractured hip may cause the two sides of the fracture to displace, or move apart, so that they no longer line up correctly. A fracture that has not displaced is much easier to treat than one that has. A displaced fracture also increases the risk of damaging the blood supply to the femoral head, causing AVN (discussed earlier). The treatment for a hip fracture begins immediately by making sure the patient is medically stable. Once the doctor is sure that the patient is stable, decisions concerning the treatment of the fracture can be made. Rarely is a fracture considered stable, meaning that it will not displace if the patient is allowed to sit in a chair. But if the fracture does seem stable, the patient may be treated without surgery if the doctor feels that the patient will be able to get out of bed within several days. Most hip fractures would actually heal without surgery, but the problem is that the patient would be in bed for eight to 12 weeks. Doctors have learned over the years that placing an aging adult in bed for this period of time has a far greater risk of creating serious complications than the surgery required to fix a broken hip. This is the main reason that surgery is recommended to nearly all patients with fractured hips. Nearly all hip fractures in the elderly are treated with some type of surgical operation to fix the fractured bones. If possible, the surgery is normally done within 24 hours of admission to the hospital. The goal of any surgical procedure to treat a fractured hip is to hold the broken bones securely in position, allowing the patient to get out of bed as soon as possible. Many methods have been invented to treat the different types of fractures. Most hip fractures are treated in one of three ways: with metal pins, with a metal plate and screws, or replacing the broken femoral head with an artificial implant. Fractures that occur through the neck of the femur, if they are still in the correct position, may require only two or three metal pins to hold the two pieces of the fracture together. This procedure, called hip pinning, is fairly simple and allows patients to begin putting weight down right after surgery. Some hip fractures occur below the femoral neck in the area called the intertrochanteric region. These fractures are called intertrochanteric hip fractures. These hip fractures are usually truly the result of a fall and often are the hardest type of fracture to treat. They often involve more than one break. As a result, several pieces of broken bone must be held together. Surgeons usually try to fix this type of fracture using a metal plate and compression hip screw. This approach helps align the bones and relies on the force of the muscles to compress the fractured bones together so they will heal. When the hip fracture occurs through the neck of the femur and the ball is completely displaced, there is a very high chance that the blood supply to the femoral head has been damaged. This makes it very likely that AVN of the femoral head will occur as a complication of this type of hip fracture. As mentioned earlier, AVN causes the bone of the femoral head to die. The femoral head begins to collapse weeks later, causing more problems in the months to come. This will most likely result in a second operation several months later to replace the hip due to the AVN. The likelihood of this is so great that most surgeons will recommend removing the femoral head immediately and replacing it with an artificial femoral head made of metal. This operation is called a hemiarthroplasty. (Hemi means half, and arthroplasty means artificial joint.) The procedure is called hemiarthroplasty because only half of the joint is replaced. The socket of the hip joint is left intact. The complications that can develop after a hip fracture are what make the injury a life-threatening problem. Some complications can result from surgery, but many can occur whether the fracture is treated with surgery or not. Getting the patient out of bed and moving can reduce the risk of developing all these complications. If an operation is necessary to stabilize the fracture and get the patient out of bed quickly, this will actually reduce the overall risk of developing these complications. That doesn't mean that the complications may not still occur after surgery, but they are far easier to treat if the patient can be mobilized. Bed rest can increase the risk of developing pneumonia in older patients. If anesthesia is required for surgery, the risk is even greater. After any injury that requires bed rest, you will need to do several things to keep your lungs working their best. Your nurse will coach you to take deep breaths and cough frequently. Getting out of bed, even upright in a chair, allows the lungs to work much better. As soon as possible, you will be allowed to sit in a chair. The hospital's respiratory therapists have several tools to help maintain optimal lung function. The incentive spirometer is a small device that measures how hard you are breathing and gives you a tool to improve your deep breathing. If you have any other lung disease, such as asthma, the respiratory therapist may also use medications that are given through breathing treatments to help open the air pockets in the lungs. Hip fractures cause pain when you move, even in bed. As a result, you stop moving around to shift your weight from time to time as you normally would. When you are lying down, there is pressure on the skin in certain areas. This pressure actually stops the blood flow to the skin by closing off the blood vessels that go to that area. Usually this isn't a problem because you soon shift your weight, moving the pressure to another area. This shifting of the pressure allows the blood flow to return to the area of skin and prevents any damage. But if something prevents you from shifting and the pressure stays constant in one area, that area of skin may eventually become damaged due to lack of blood flow. This damage is called a pressure ulcer or bedsore. The pressure causes the skin to actually die, similar to skin that has been burned with heat. First the area hurts, then it begins to blister, and then it turns into an open sore. These sores are difficult to heal if they are large. They may actually require a skin graft. They can become infected, causing other problems. The best treatment is to prevent bedsores in the first place. Hospitals use special mattresses and special water beds to help distribute weight evenly in people who must be confined to bed. Nurses also routinely move patients in bed to make sure the skin is not getting too much pressure in one area. Still, the best way to prevent pressure ulcers is to get you out of bed and moving. Aging adults who suffer a hip fracture and go to the hospital are under a lot of stress. Unfamiliar surroundings, pain medications, and the stress of the injury can lead to changes in a patient's behavior. This is sometimes called the sundowner syndrome because it seems to get worse at night. This can be very frightening to both patients and their families. Fortunately, it is almost always temporary. It can cause problems because patients can become difficult to handle and won't follow instructions. They may try to get out of bed and can damage the hip further. The best treatment for mental confusion is usually to get patients moving and out of the hospital. Familiar surroundings, familiar faces, and activity are the best treatments. Medications are used when necessary, and it may be necessary to restrain patients during this period so that they will not hurt themselves further. Other medical conditions can cause confusion, and the doctor will make sure that these are not present. But, again, usually the mental confusion is temporary and will go away in a matter of days. Hip fractures usually require surgery. Nonsurgical rehabilitation is only used in a few instances after a hip fracture in an aging adult. A patient with other complicating illnesses who fractures a hip may be treated with traction. A traction pull on the injured limb is a means, other than surgery, of helping the bone fragments to line up. Patients who have a stable fracture (mentioned earlier) may also receive nonsurgical rehabilitation. These patients may require a few days' bed rest before getting assistance to stand and walk. When the doctor determines that the fracture has healed, a formal program of physical therapy lasting four to six weeks may be prescribed. The aim of most surgical procedures for a fractured hip is to help people get moving and walking as quickly as possible. This helps them avoid dangerous complications that can arise from being immobilized in bed, such as pneumonia, blood clots, joint stiffness, and pain. A physical therapist usually works with patients in the hospital soon after surgery. You'll be assisted from your bed to a chair several times each day. You'll begin walking with a walker or crutches, practice accessing the bathroom, and start doing exercises to tone the muscles around the hip and thigh and to prevent the formation of blood clots. The amount of weight that can be placed on the operated leg depends on the type of surgery performed. Most patients are able to start weight bearing right away after surgery. Depending on the severity of the fracture, patients may only be able to place partial weight down right away. Patients who require hemiarthroplasty follow a different treatment plan. This surgery is more involved and requires the surgeon to open up the hip joint during surgery. This puts the hip at some risk for dislocation after surgery. To prevent hip dislocation after surgery, patients follow strict guidelines about which hip positions they must avoid, called hip precautions. Patients follow these precautions at all times for at least six weeks after surgery, until the soft tissues gain enough strength to keep the joint from dislocating. Patients may be instructed to use their walker or crutches to limit the amount of weight they place on the operated leg. After you return home from the hospital, your surgeon may have you work with a physical therapist for two to four in-home visits. This is to ensure you are safe in and about the home and getting in and out of a car. Your therapist will make recommendations about your safety, review your hip precautions, and make sure you are placing a safe amount of weight on your foot when standing or walking. Home therapy visits end when you are safe to get out of the house. Additional visits to outpatient physical therapy may be needed for patients who have problems walking or who need to get back to physically heavy work or activities. The therapist's goal is to help you maximize hip strength, restore a normal walking pattern, and help you do your activities without risking further injury. When you are well under way, regular visits to the therapist's office will end. Your therapist will continue to be a resource, but you will be in charge of doing your exercises as part of an ongoing home program.